Advantages: Great photo coverage across a range of Luftwaffe subjects; helpful captions; well-presented format; five large full-colour photographs and four aircraft featured in colour profiles. The latest edition of Luftwaffe Im Focus continues with this series' excellent photographic coverage of Luftwaffe subjects from the Second World War. This newest publication is the second "Spezial" to appear, and it is larger than the normal editions at 56 pages plus covers. The focus of this issue is Luftwaffe aircraft during 1945. Not surprisingly, many of these aircraft are abandoned or wrecked, but this does not detract from their interest nor importance. Most of the 53 photos are large and clear in black and white, but there are five full colour photos included in that number. The tone and quality of these colour photos is very good indeed, and they are presented large on the page. One of the colour photos is a magnificent side view of the enigmatic all-black Messerschmitt Bf 109 G-6/AS, "Green 5". Subjects covered in the 1945 Special include Bf 109s, Bf 110s, Ju 188, Fi 156, Fw 44, Me 262, He 219 and even a Ju 88 / Fw 190 Mistel combination. Some of the subject aircraft have been photographed from different angles - an excellent reference aid to the modeller. In addition to the photographs, the book includes four high quality profiles. One of these, a captured La-5FN, is supplemented with a bottom plan view showing the stenciled markings on the yellow lower surfaces, typical of Zirkus Rosarius aircraft. Another surprise is the inclusion of a Zirkus Rosarius P-51C Mustang. Full text and captions are both provided in German and English. The captions are helpful and quite exhaustive, with details about units and locations where that information is available. 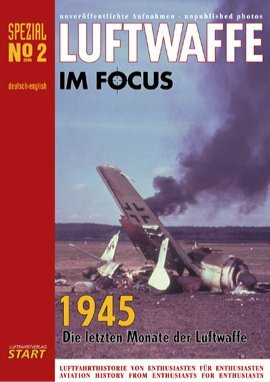 The focus on 1945 and the extra pages are welcome in Luftwaffe Im Focus Spezial No.2. This is another great reference source for Luftwaffe historians and modellers.